The Delta 4 rocket that will launch in October for the direct benefit of the world's population using the Global Positioning System was stacked on its Cape Canaveral pad last week. The United Launch Alliance-made vehicle is targeting an Oct. 4 blastoff to deploy the GPS 2F-3 navigation satellite, replacing a 19-year-old craft in the orbiting constellation that serves billions of military and civilan users across the planet. Liftoff will be possible during a morning launch window extending from 8:10 to 8:29 a.m. EDT (1210-1229 GMT). Riding horizontal aboard a 36-wheel, diesel-powered transporter, the bright orange and white rocket, stretching 170 feet long, emerged from the assembly hangar and took the brief trip down the road and up the pad's ramp to the Florida spaceport's Complex 37. Initial assembly of the rocket, including mating of the cryogenic upper stage with the Common Booster Core first stage using a precision laser alignment system, had been completed inside the Horizontal Integration Facility over the past couple of months. After the vehicle arrived at the base of the pad, technicians went to work getting equipment ready to raise the rocket vertically. The erector system and its hydraulic pistons then lifted the rocket upright and set the vehicle atop the pad's launch table. Later in the week, two solid-fueled strap-on boosters were mounted to the first stage to provide additional thrust at liftoff. The rocket will be flying in the Medium+(4,2) configuration. The satellite payload was shipped to the Cape from Boeing's production factory in Los Angeles aboard a C-17 on July 9 to begin its own preparations for launch, including final testing, fueling and encapsulation in the rocket's nose cone. It will be hauled to the pad and hoisted atop the Delta 4 next month. This will be the third satellite in the Block 2F series of GPS spacecraft with improved accuracy, enhanced internal atomic clocks, better anti-jam resistance, a civil signal for commercial aviation and a longer design life. Boeing is building a dozen craft to upgrade the constellation's foundation over the coming years. 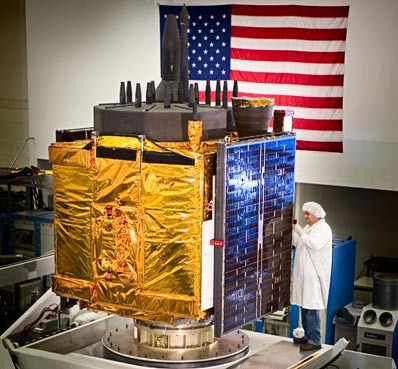 Known as the GPS 2F-3 satellite, this newest spacecraft will take the place of the GPS 2A-21 bird that was launched by a Delta 2 rocket on June 26, 1993 and began its remarkably long-lasting service life on July 21, 1993. Given its advanced age, controllers have targeted it for replacement with this launch into the Plane A, Slot 1 position of the constellation. But the old craft won't be retired immediately, instead moving into an auxiliary role within the A-Plane of the network. 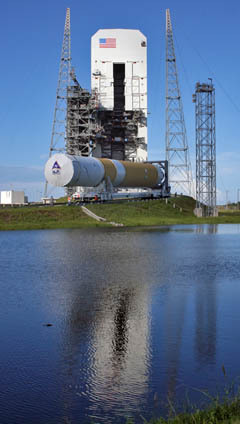 The first two Block 2F birds were launched by Delta 4 rockets in May 2010 and July 2011. The latest spacecraft should be operational about 30 days after liftoff. "As each 2F satellite becomes operational, we continue the seamless transformation of the GPS constellation into an even more accurate, reliable and durable navigation resource for the U.S. military and the global civilian user community," said Craig Cooning, vice president and general manager of Boeing Space & Intelligence Systems. "Our efficient pulse-line manufacturing process, adapted from Boeing's commercial airplane production lines, also ensures that we deliver each spacecraft on time and on cost." Today's GPS fleet is comprised of 31 satellites, including 10 Block 2A's made by Boeing, 12 Block 2R's and seven 2R-Modernized spacecraft built by Lockheed Martin, and Boeing's two Block 2F vehicles. "The GPS constellation remains healthy, stable and robust with 31-operational satellites on-orbit providing precise position, navigation and timing information to users worldwide," an Air Force spokesperson said.